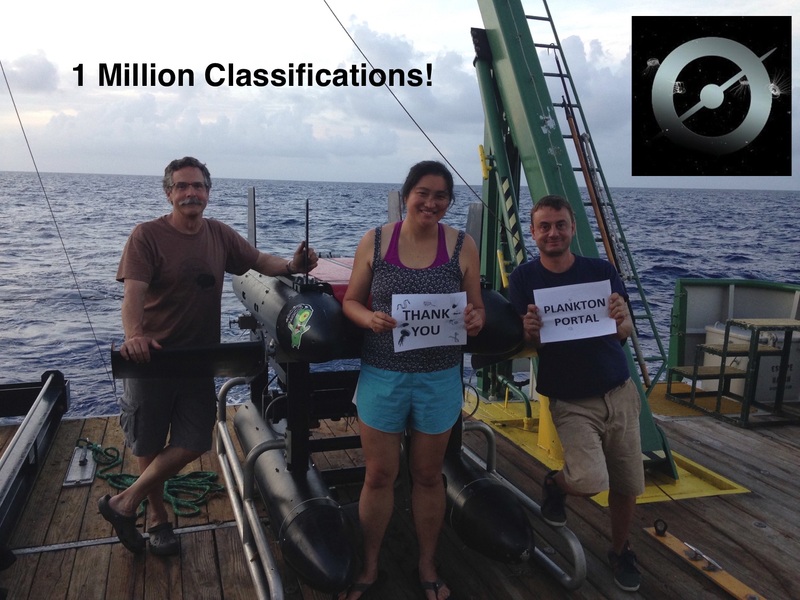 Last week, Jean-Olivier and Zuzana organized a push to one million (1,000,000) classifications here at Plankton Portal in honor of my defending my PhD on Friday, October 30, 2015. The PhD defense at the University of Miami essentially consists of a 1-hour public seminar on my dissertation research, which I had conducted over the last five+ years, and then a multi-hour private question-and-answer session with my committee. In my case, my committee consisted of my advisor, Dr. Robert K. Cowen, and four other professors, Drs. Su Sponaugle, Gary Hitchcock, Rob Condon, and Jean-Olivier Irission. At the end of the private session, if the work and the answers to the questions were deemed satisfactory, then the student passes and essentially is this granted a doctorate. 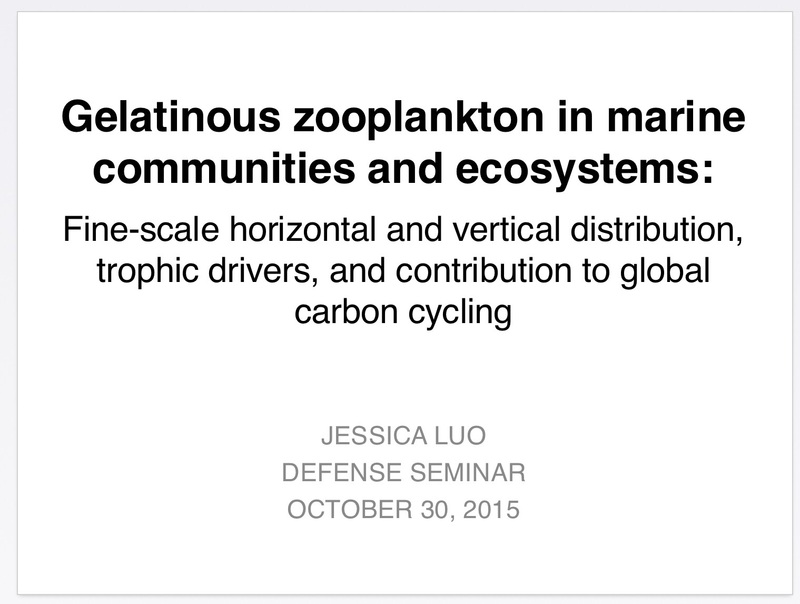 So I have two happy news: 1) My PhD defense was successful – all went well! and 2) We did it! Plankton Portal reached one million classifications by the time I defended! The above photo shows Professor Cowen, me (Jessica), and Cedric Guigand with ISIIS (the instrument that collects all the cool images in Plankton Portal!) on board the R/V Walton Smith on a cruise in the Florida Keys this past summer. We had taken it in anticipation of a Plankton Portal classification milestone; little did I know that it would be in conjunction with my PhD milestone! In my PhD, I looked at gelatinous zooplankton (jellies) in marine ecosystems from three contexts: in aggregations at fronts (that’s the California current dataset on Plankton Portal! ), as predators of other plankton in driving vertical migrations, and as contributors to the global carbon cycle. For the first two parts (“chapters”), I focused on small jellies, and studied them using ISIIS, and for the last chapter, I conducted a modeling study on all jellies (medusas, comb jellies, and salps/pelagic tunicates) over the global oceans. It’s been a really educational process for me, learning about jellies, imaging systems, modeling, and overall, how to do science. I’ve been able to publish one of my dissertation chapters already, and look forward to publishing the rest over the next six months. Grad school has also been a really fun opportunity for me to get out in the field (on five research cruises), go to conferences all around the world (Japan, Spain, Hawaii), help run citizen science projects like Plankton Portal, and just overall meet some incredible people who do fascinating work. It’s been a total privilege, one that I haven’t taken lightly. And I look forward with anticipation to the journey to come. Onwards and upwards! This entry was posted in Citizen Science, Science and tagged classifications, defense, graduate school, one million, PhD, science by jessicaluo. Bookmark the permalink. Congratulations on your successful defense! And many thanks for giving us an idea of what happens to all of that data that is collected at the Plankton Portal.